1997-06-09. New. Ships with Tracking Number! INTERNATIONAL WORLDWIDE Shipping available. Buy with confidence, excellent customer service! 2013-07-05. New. Ships with Tracking Number! INTERNATIONAL WORLDWIDE Shipping available. Buy with confidence, excellent customer service! 2013-04-08. New. Ships with Tracking Number! INTERNATIONAL WORLDWIDE Shipping available. Buy with confidence, excellent customer service! 2013-07-05. Good. Ships with Tracking Number! INTERNATIONAL WORLDWIDE Shipping available. May not contain Access Codes or Supplements. May be ex-library. Shipping & Handling by region. Buy with confidence, excellent customer service! 2013-04-08. Good. Ships with Tracking Number! INTERNATIONAL WORLDWIDE Shipping available. May not contain Access Codes or Supplements. May be ex-library. Shipping & Handling by region. Buy with confidence, excellent customer service! Books On Tape, 1994-01-01. Unabridged. Audio Cassette. Used:Good. Norwalk, Conn.: Easton Press. Fine with no dust jacket. 1992. Hardcover. Full leather titled/decorated in gilt, all edges gilt, silk ribbon marker, hubbed spine, moire endpages. Collector's edition. Slight flecking to gilt edge else fine condition. Appears unread. Publisher's bookplate laid in. ; 8vo 8" - 9" tall . Simon and Schuster. Used - Very Good. Very Good condition. Very Good dust jacket. Part 1. Fine Communications, 1997-07-01. Hardcover. Used:Good. Simon & Schuster. Hardcover. B0000DSW4P New Condition. . New. Fine Communications. Hardcover. 1567310125 New Condition. . New. Simon & Schuster. Hardcover. B000HFCEKC New Condition. . New. Simon Publishing -, 1954. 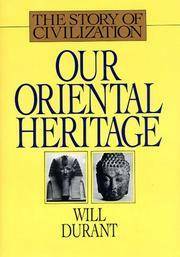 Hardcover/pub.1954/Fair condition/1049 pages - A history of civilization in Egypt and the near east to the death of Alexander, and in India, China and Japan from its beginning to our own day; with an introduction on the nature and foundations of ci vilization. [KN2v24345]. Hard Cover. Good. 1997-06-09. Good. Ships with Tracking Number! INTERNATIONAL WORLDWIDE Shipping available. May not contain Access Codes or Supplements. May be ex-library. Shipping & Handling by region. Buy with confidence, excellent customer service! Simon & Schuster. Hardcover. B00005WJGO Book is in very good condition. Customer service is our #1 priority. We sell great books at great prices with super fast shipping and free tracking. . Very Good. Fine Communications. Hardcover. 1567310125 Like New Condition. . Fine. N.Y.: Simon & Schuster. Very Good. 1954. Hard Cover. 8vo - over 7¾" - 9¾" tall Seller highly recommended with over 935 lifetime positive feedback ratings. Seventeenth printing. .
Simon & Schuster. Hardcover. B000HFCEKC Like New Condition. . Fine. Simon & Schuster. Hardcover. B0000DSW4P Like New Condition. . Fine. N.Y: Simon & Schuster. Very Good/Very Good. 1963. Hard Cover. 8vo - over 7¾" - 9¾" tall HIGHLY RECOMMENDED SELLER . N.Y: Simon & Schuster. Very Good/Fair. 1954. Hard Cover. 8vo - over 7¾" - 9¾" tall HIGHLY RECOMMENDED SELLER . New York: MJF Books. Hard Cover. Fine/Fine. 1047pp. wirh numerous b&w photos and maps in end papers. First volume in the 'Story of Civilisation' series. Folllows the Indian, chinese and Japanese civilisations from their beginnings to the 12th century. Simon & Schuster, 1954-01-01. Hardcover. Very Good. HB with slight wear, corners rubbed spine slightly sunned, no writing or marks, clean pages without marks, no dust jacket, 1954. New York: Simon & Schuster. Good with no dust jacket. 1963. Hardback. 1049 pages . MJF Books, 1997-07. Hardcover. Good. N.Y.: Simon & Schuster. Fair. 1941. Hard Cover. 8vo - over 7¾" - 9¾" tall slightly cracked at front board . Avon Books. 7th. 1983. vg. Paperback. Signed by Author ISBN:0380641216 752 pages; 9" tall; presentation copy signed by the author to Heidi; pp browning. .
Fine Communications, 1997. good hardcover with no dust jacket. 1997. Boards blemished, back hinge split. . Hardcover. Good/No Dust Jacket. Simon & Schuster. Hardcover. B000HFCEKC Very Good Condition. Has some wear. Five star seller - Buy with confidence! . Very Good. Hardcover. Simon and Schuster, 1954. Good. . Condition: Simon and Schuster, 1954. Good. Simon & Schuster, January 1954. Hardcover. Used - Good/Fair. Book in overall good condition. Pages are all intact. Jacket is in fair condition. Several chips and tears located throughout.